Stars: Benicio Del Toro, Tim Robbins, Olga Kurylenko, Eldar Residovic, Melanie Thierry, Fedja Stukan. This black comedy centres around Mambru (Benicio del Toro) and B (Tim Robbins), a couple of aid workers in the Balkans during the conflict of the 90s. Working with an NGO known as Aid Across Borders, they deal with the horrors of the war and the vicious consequences of ethnic hatred almost on a daily basis. The film begins with the pair trying to raise a morbidly obese body from a well in a remote village before it can contaminate the water supply. A lack of suitable rope hampers their mission thus setting them off in search of equipment. Further complications arise when the UN administration specifically forbids them to remove the body for fear of upsetting the locals. The UN advisor who is compiling a report on the team’s efficiency is “conflict evaluator” Katya (former Bond girl Olga Kurylenko), who had a relationship with Mambru that ended badly. 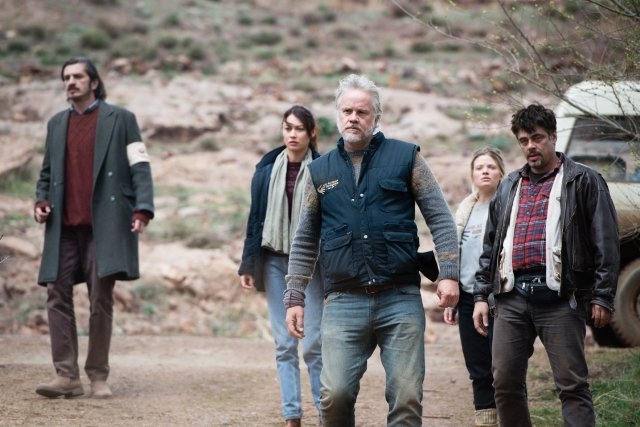 Tension is in the air as they set off with their interpreter Damir (Fedja Stukan) and new recruit Sophie (Melanie Thierry) on a journey that reveals some of the horror of war. And Nikola (Eldar Residovic), an orphan boy they come across, puts a more human face on the carnage and adds a more sympathetic element to the material. A Perfect Day is the first English language feature for Spanish director Fernando Leon de Aranoa (Barrio, Familia, etc), and he maintains a light touch throughout. He mixes black humour with an exploration of the absurdity of military authority and the futility of war. Black humour at the expense of military authority and the helplessness of the UN is reminiscent of the classic M*A*S*H.
In one of his better performances for some time Robbins is excellent here with his irreverent sense of humour and acerbic observations, while Del Toro’s swarthy presence, cynicism and ironic detachment adds gravitas. Their banter is amusing, and alleviates some of the tension of the dramatic journey through this war torn countryside. Alex Catalan’s superb cinematography of the arid mountain landscapes and war devastated backdrop further enhances this enjoyable comedy/drama. This ironically titled pitch black comedy was one of my highlights of the Melbourne International Film Festival in 2015.